City Natives have won their third East Coast Music award. 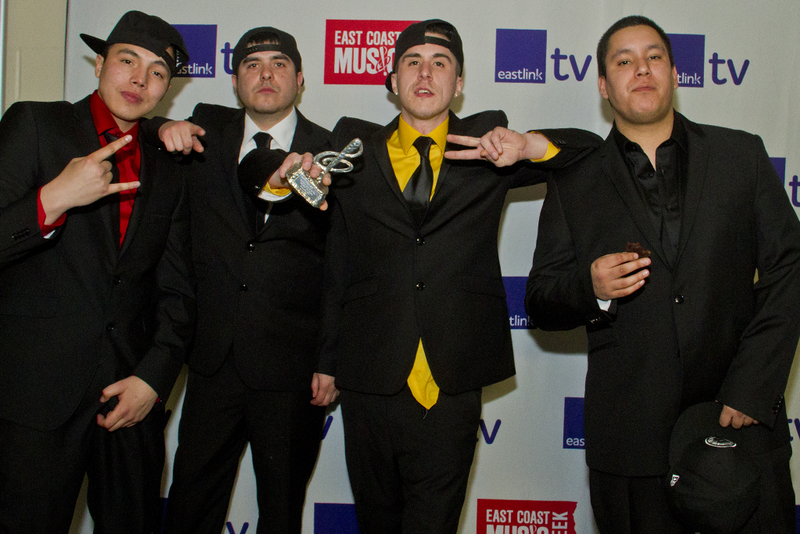 The rap group nabbed the 2016 Aboriginal Recording of the Year during the gala show at Centre 200 in Sydney, N.S. Thursday evening. “I’m really happy tonight with our win,” Blake Francis, who goes by the stage name BNE, said backstage following their win. “Sometimes, hard work doesn’t go and get recognized but our hard work is definitely being recognized,” Francis, who lives in Eel Ground First Nation, N.B., said. 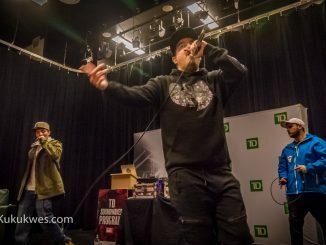 The other acts nominated in the Aboriginal recording category included rappers Kam Speech, Tristan Grant and classical recording, Pillorikput Inuit, a collection of Labrador Moravian choral and congregational songs in Inuktituk. 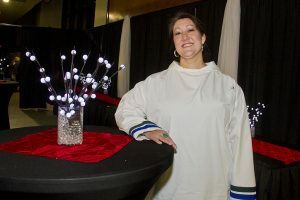 Deantha Edmonds, who sang soprano on Pillorikput Inuit with tenor Karrie Obed for the recording, was in the audience representing the team who worked on the classical album. “It was really remarkable to have this classical album be included in this category,” Edmonds said following the awards ceremony. “As Aboriginal musicians and artists, it is great to see we’re being recognized for a wide spectrum of what we do,” she said. 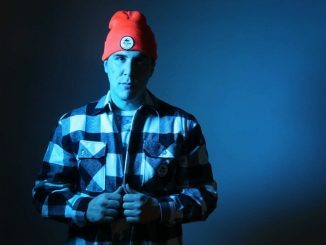 Edmonds, who is originally from Newfoundland and Labrador, is the first classically trained singer of Inuit descent in Canada. She currently lives in New Brunswick where she teaches music. Edmonds said she was okay with City Natives winning the award this year. 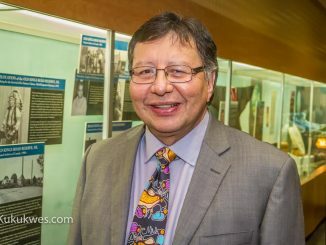 “I recognize that it’s time for City Natives to be recognized and to be lifted up and congratulated and applauded for the work they have done as well,” Edmonds said. 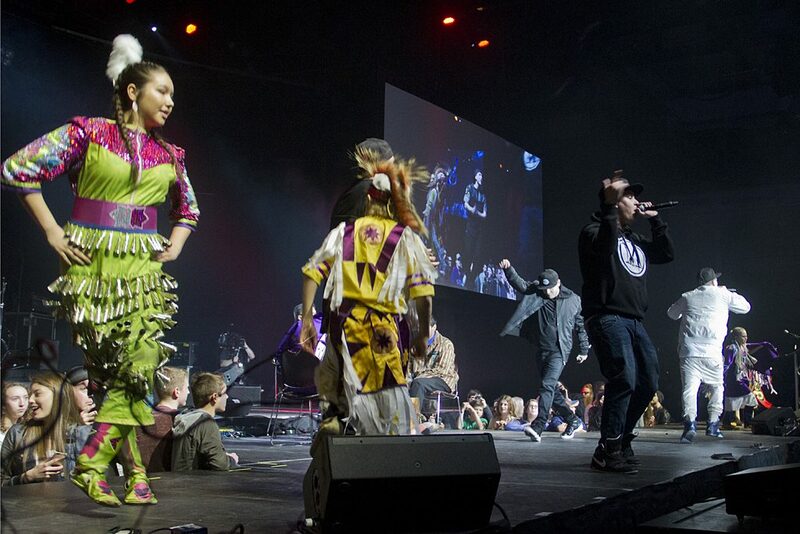 City Natives was the only act from the Aboriginal and Rap/Hip-Hop categories to perform at the gala show. The group performed a medley of Beastmode from their album, Voltron and Straight Chief’in from the album, Red City. The group’s performance included powwow dancers from the Maliseet community of Tobique First Nation, N.B. and drummers from Membertou First Nation, N.S. Shelby Sappier, who goes by the stage name of Beaatz, said it was the first time the group involved its culture into a performance. 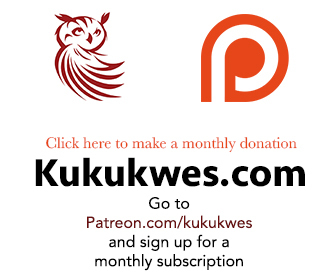 “We wanted to bring Mi’kmaq and Maliseet dancers and drummers because we’re a Mi’kmaq-Maliseet group,” Sappier said. “So we brought dancers from Tobique and we brought drummers from Membertou,” he added. 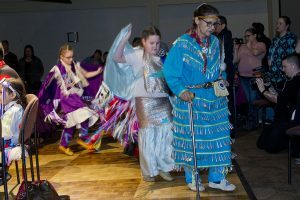 An opening ceremony to kick off East Coast Music Week was held at the Membertou Trade and Convention Centre Wednesday evening. The event included drummers from the Sons of Membertou and Stoney Bear from Eskasoni and powwow dancers. The ceremony was followed with the Aboriginal Stage in which three of the four acts nominated in the Aboriginal recording category performed on stage. For the first time, the conference portion of East Coast Music Week is being held at the Membertou Trade and Convention Centre. 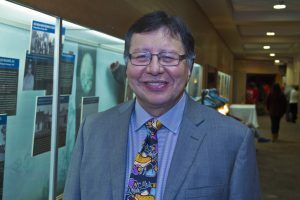 “We’re pretty excited to host it,” said Dan Christmas, senior advisor for the Membertou First Nation. “We have a lot of the entertainment here but to have the conference here as well and to have some of the Aboriginal artists featured, it’s great,” he added. Christmas said he expects surrounding businesses in the community such as the Hampton Inn, the food venues and retails stores to do well during East Coast Music Week. “We have a huge boost of customers here for the next few days so obviously, the economic spin will be huge,” Christmas said.